Hi, I’m Ed Otto, owner/operator of The Cake Gallery in Omaha, Nebraska, an author and a writer on behalf of the wedding cake industry. I’m thrilled you’ve joined me, because I can’t wait to share 3 proven break-throughs that will help you sell more wedding cakes, with less effort and best of all get higher prices. I stumbled across these concepts while surveying and speaking with thousands of brides all across the country over the course of the last 10 years. overwhelming love we receive from brides. So, let’s take a look at some of the proprietary Key Research Discoveries. In fact, using these key research discoveries will separate yourself from your competitors to the point, brides would be literally foolish to use anyone else. And as a result you’re able to charge prices that are worthy of your time and skill, instead of wondering if you’ll be undercut by your competition. because finishing second means you’ve lost. That decisive statement makes you realize there are only two outcomes. Either you get the order or you don’t. There is no gray area. Having a pretty good website, pretty good consultation, pretty good tasting cakes, or having a pretty good sales process are fine if you feel finishing second is pretty good. To WIN you need to position yourself as the perfect choice. It helps you come to grip with how brides judge you and what their perception of you needs to be. It’s tells you what it takes to rise above being pretty good and be sure you come out the WINNER. One side of your face shows your “External Perception.” It’s the way a bride, and anyone else who can influence her, sees your business. Moreover, it’s the opinion your bride forms from all the interactions she has with your bakery or cake boutique. 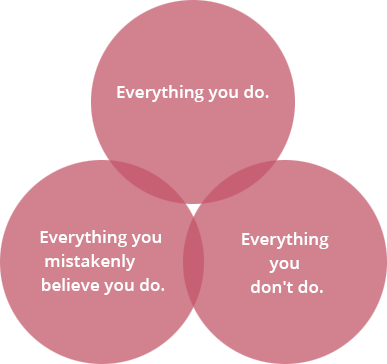 It’s everything you say, do, everything you mistakenly believe you say and do, and what you don’t say or do. The 3 rings illustrate how a bride’s “External Perception” is formed. Most bakery or wedding cake business owners are aware of the top ring, but are not aware or pay attention to the bottom 2 rings. Everything you do refers to all the information your prospective bride absorbs through all channels of communication. It can be from your website, phone conversations, emails, text messages, bridal shows, magazine ads, testimonials, a vendor’s recommendation etc. Perception.” As an example, you believe your cakes are gorgeous, but the reality is, you’re still creating designs from 2012, instead of what they are seeing in the latest issue of Bride’s magazine. In another example, you see your website as very functional, full of information, and very creative. But, a bride takes a look at you website and sees the great photos, but no information as to why she should call you over your competitors. What she sees is, you saying the same platitudes they are; such as saying you use fresh ingredients or you care more. What you don’t do refers to things that you don’t do because you don’t know any better… you do know better, but don’t want to do them. Or, your competitor does things you don’t or won’t. For example, you may not want to schedule consultations on Sundays or evenings. You may not want to offer cakes made with only organic ingredients. You may not know how to create a wedding cake topper made with modeling chocolate, so you don’t offer it. Listen, I know the bottom two rings can be confusing to understand until you’ve taken some time to absorb them. So, I highly suggest you take a look at the last 3 paragraphs a few times until it’s clear. It’s important to recognize whether you need improvement, or whether you don’t give yourself enough credit for what you do well. Here’s the ideal “Internal Reality:” It should encompass everything you do and everything you are that makes you great. It’s all of your skills, your expertise, your superior wedding cakes, your people, focus on customer service and satisfaction, your streamlined systems, unique innovations, and your commitment to excellence, including your passion! But here’s an unknown problem you might be having: You may offer the best wedding cakes and customer service in town, but none of that means anything to a prospective bride who DOESN’T know you and hasn’t had any experience with you! Your bride wants to make the best buying-decision possible—not just on price, but on perceived value! If your current marketing and sales strategies don’t help your bride through the “sifting process,” you’re not going to WIN all the orders you deserve. You must rise above the noise. Getting to the point of rocketing wedding cake sales and rising above the noise is accomplished by creating a superior “Internal Reality” and then projecting an “External Perception” that is so persuasive, you become the obvious choice for her to do business with you. Step two. Take all the things you already do well, then add the suggested “Credibility Boosters” from the “Creating The World’s Greatest Internal Reality” video in step one. Step three. Let your brides know how awesome you are through your website, at bridal shows, when you meet them for a consultation, in emails, in tweets and every sales and marketing situation possible. All of this will result in giving you a stunning “External Perception”. 2) “Internal Reality” defines everything you do. 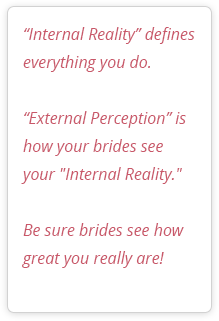 External Perception is how your brides see your Internal Reality, whether it’s accurate or not. 3) Understand that a bride judges you from more than everything you do. They also judge everything you mistakenly believe you do, and everything you don’t do. 4) Evaluate your “Internal Reality” and improve it. 5) Take all the things you do well and as many “Credibility boosters” from the video “Creating The World’s Greatest Internal Reality” to create an “External Perception” that makes you the obvious choice and WINNER. 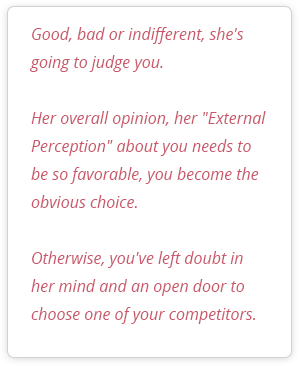 The most important lesson in the first video is, brides judge you according to your “External Perception”. Their overall opinion of everything you do, everything you don’t do and everything you mistakenly believe you do, will determine whether you’re in even being considered as the possible winner. As a side note, you will receive a full explanation for “Creating The World’s Greatest Internal Reality” in the 3rd video. The second video is “The Insecurity Gap.” This gap represents a bride’s inability to find a wedding cake artist that matches her preconceived expectations. Notice I said “Preconceived Expectations.” It is one of the key research discoveries you’ll want to remember. Every bride who walks through your door has some preconceived expectation about the kind of service you’re going to provide. If you don’t fulfill her expectations, at best you’ll only be seen as the dreaded…pretty good. 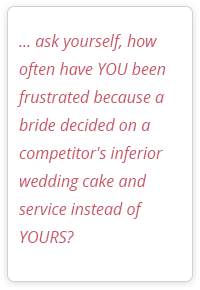 To prove my point, how often have YOU been annoyed because a bride decided on a competitor’s inferior wedding cake instead of YOURS? 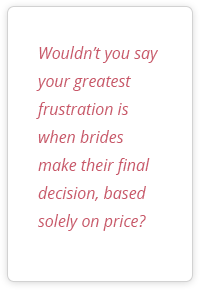 Or, the frustration you feel when brides make their final decision, based on price? While I’ll be addressing both of these issues in the upcoming video, keep in mind, taking measures to eliminate The Insecurity Gap, provides solutions to both of the previous questions, as well as additional concerns, which could be driving brides to your competitors. Is due to “The Insecurity Gap” a bride feels about choosing you…or anyone. In plain English it means, they’re not sure who they should pick. I think you would agree, women are complicated creatures. And, part of their complex nature is to feel insecure in many areas of their lives. What the research shows is, if you conquer a bride’s insecurities when buying a wedding cake, she’ll love you, and, as a result, you’ll dramatically increase sales. Let me explain how this dilemma has been compounded to the point where you’re forced to take action. The dawn of the web and cable TV age brought with it better technology and an abundance of competition within the wedding cake industry. Today, instead of battling a few top competitors, there are dozens or hundreds to choose from. As a result, all of us are finding it more difficult to stand-out from our competitors. For example, on WeddingWire’s website, there are 74 wedding cake bakers in Miami, 67 in Denver, 104 in Phoenix, and 64 in Kansas City to choose from. In fact, there are over 60 registered wedding cake bakers in each of the top 60 markets. And those are only the listed ones. How many more home bakers are there who not even listed? The old days of relatively low competition were called, “the days of easy selling.” Everything was less sophisticated, and it used to be easier for a wedding cake baker to make a sale. Not anymore. Now there is a virtual shopping-mall of cake bakers available to your bride. Let’s face it, today, it is Internet instant information and multiple choices in your marketplace. Brides prefer to review information on their own timetable, at their own pace, on their own terms. That gives brides all the power! cluttered with sales messages. Lucky for you and me, most of these wedding cake providers say the same meaningless dribble without communicating any worthwhile information as to why a bride should choose them. This leaves a door that’s wide open for you and me because the bride, even though she has the power, still can’t tell who’s any better, worse or different, or offers the best value! In other words, brides tell me they are not receiving what they expect from bakers. Instead, they are settling for what bakers offer. In their decision making process brides are choosing a baker who seems to provide the best cake and service, not necessarily the baker offering the best value. It clearly shows, most bakers are not addressing a brides expectations. So, the real issue becomes, how do you stand head and shoulders above your competitors and at the same time deliver what she expects? The best way to understand this is by using a legal analogy. Your bakery or cake boutique is on trial each and every day. Your brides are the judge and jury, and YOU are the defending attorney. Ask yourself, what will you say to the jury of brides in order to convince them to rule in your favor? Let’s have a test and see if you can chose which or the following pieces of evidence will help you WIN over the brides. You are the premiere baker/designer in town. You’re the biggest in town. You make cakes with a personal touch. You create custom wedding cakes. You can answer all their wedding cake questions. You care more about your customers. Or my favorite…You love making cakes. Remember, the verdict is innocent (winning brides over) or life (losing the order). Did you find at least 3 convincing pieces of proof from the list? Sorry, but any of the above responses will put you on a fast-track to losing the case. Why? Because most of your competitors can and do say the same things in the bullet list. Ask yourself this question. Do any of the bulleted statements separate you from your competitors? Here’s another test to illustrate this point. It’s called the “Cross-Out Write-In” test. Let’s use your website as the example. If a competitor can cross-out your name and place their business name in its place and everything else is still true…you’ve failed to distinguish yourself. Why, because it means they can make claims to all the same things you’re saying and doing. It solidifies the fact you’re not separating yourself from your competitors. It also works the other way around. Can you cross out the business name on all your competitors websites, insert yours and still make a valid claim? If you can, at least you know your “External Perception” is as good as theirs. On the other hand, if you can’t insert your name, they probably have an edge over you when it comes to providing high-value or more compelling evidence. Are you beginning to see why brides view bakers as being the same and can’t tell who’s any better, worse or different? statements or low-value pieces of evidence making you stand out from the crowd or persuading the jury of brides? Look at your website, review your sales process when it comes to your consultations and rethink and retool what you say and do. 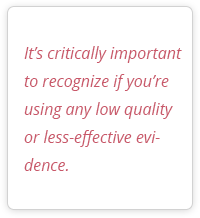 It’s critically important to recognize if you’re using any low-value or less-effective evidence. If your answer is yes, I suggest you begin making immediate changes to your evidence and start using distinct and high-value proof. Let me pass along a comparison. I ran the above evidence past an attorney and asked hypothetically whether he could use the bullet list in court to convince a jury of how great a particular baker is? His answer; if you went into a courtroom with evidence that weak, the jury would roll their eyes and dismiss them. Do you think your brides might be having the same reaction? According to the attorney, it’s horrible evidence. It wouldn’t convince any juror, let alone a jury of brides. When I discovered this concept, I immediately began offering high-value evidence that would separate myself from competitors and put me into a position to WIN the case with my brides. He’s a firm believer of whoever presents the most compelling evidence WINS. So, when selling wedding cakes offer the most compelling evidence. For example, here’s 5 pieces of evidence I use to overcome the “Insecurity Gap” with my brides. 3rd I have a $10,000 wedding cake guarantee. No one in Omaha wants to touch that. In fact, no one around the country want to touch that. That’s why it made the national news. If other bakers in Omaha knew how simple and safe it was to implement, they all would do it. But, lucky for me, they’re scared beyond belief. by receiving a guarantee that she loves? By the way, the guarantee was another Keyword Research Discovery. 4th I have 26 simple to elegant wedding cake displays. Do you think a bride’s insecurity gap is reduced by having a vast amount of displays? Thus proving we can and do just about anything, even though she might only want something very simple. 5th I offer 35 flavors of cake and 35 fillings. You might be wondering why so many? On the surface it probably appears I’m trying to stand out from the crowd. However, that’s only partially correct. The real psychology behind the reason is because it reduces the insecurity gap of a bride when it comes to flavors. When a bride sees the number of options she has with us, it reduces her fear of having to choose from a limited amount of flavors. In conclusion: When you meet or exceed your brides “Preconceived Expectations” through the use of unique pieces of high-value evidence or credibility boosters like the five I’ve just shared with you, you’ll be worth MORE to your brides than your competitors. Understanding and implementing the psychological principle of “The Insecurity Gap” and the associated concept of “Preconceived Expectations” will position you to immediately WIN more wedding cake orders and ability to charge higher prices. expectations or to put it another way, what she believes you should be offering.3) Think of yourself as an attorney building indisputable evidence to WIN your case with brides. 4) Your case of evidence comes from understanding what brides really expect and creating the “World’s Greatest Internal Reality” to deliver messaging that is unique to you and your wedding cake business. Now, instead of wondering why more brides are not ordering from you, you understand that alleviating a brides insecurities is another key research discovery for getting brides to know, love and trust you, which of course, results in increased orders and higher prices. In the third video, well go over “Creating The World’s Greatest Internal Reality,” brought up as solutions in both of the previous videos. What do I have to do to get higher prices for my wedding cakes? Here’s the answer: The highly successful bakeries/cake boutiques who continuously improve their “Internal Reality” end up providing the best experience for their brides. In turn, brides are willing to pay more for the superior value. SPECIAL NOTICE: Being able to charge higher prices is contingent on more than how good your cakes look and taste. 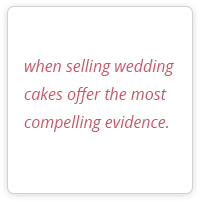 Before I go on, I also want to share the #1 fallacy about selling wedding cakes. Which is All you have to do is show brides how great your cakes taste and look; give them a reasonable price and they’ll order from you. As of this writing over 90% of bakers sell their wedding cakes using only those 3 pieces of criteria. It illustrates they think selling is somehow a natural human trait you’re born with, which doesn’t require any thought or training. True, you’ll take a certain amount of orders with that simplistic approach. But let me clarify something. First, of all, I never attempt to “SELL” a bride. The research shows you need to convince her. Second, if you’re serious about your sales and commanding higher prices, you’ll need a system that’s much more advanced. I suggest you begin by addressing your bride’s preconceived expectations and providing a superior overall experience from the first time they talk to you until the cake is delivered. If you only follow through on those 2 suggestions, you’ll be ahead of 90% of your competitors. I’ll admit, I roll my eyes when I hear someone claim they’re the “World’s Greatest.” However, I’m not talking about bragging, I’m saying this point of view is a brilliant method for visualizing yourself and displaying your business. To achieve the “World’s Greatest” internal reality, you’ll have to wholeheartedly believe in your capabilities. “World’s Greatest” cake artist, business owner or manager. 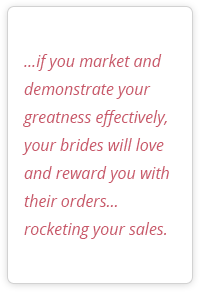 In turn, if you demonstrate your “World’s Greatest” value effectively, more brides will love, which results in more orders and your ability to charge higher prices. To put it another way, if your closing rate increases from 4 out of 10 to 8 out of 10, the surge in demand gives you the option to charge up to 30% more. Let me give you an example of the “World’s Greatest” mindset. You gave it to her because you truly believed she was “the world’s greatest mom!” The coffee mug symbolized her “greatness” for being loving, caring, and someone you adored. You’ll receive the same type of coffee mug reaction from your brides if you create an “Internal Reality” of greatness that has the same warm and fuzzy bond with your brides. 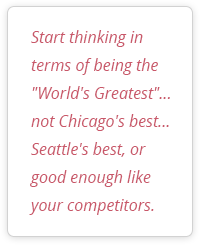 Start thinking in terms of being the “World’s Greatest”… not Chicago’s best… Seattle’s best, or good enough like your competitors. It will open your mind to a new way of thinking and a whole new way of seeing yourself and those around you. And, don’t miss the point. It’s not if you actually are the world’s greatest, it’s the mindset that you’re trying to be. If you do this, everything will change. You’ll quickly see how settling for “good enough” or second best won’t be an option. The result is you’ll create an atmosphere so special, and an experience so meaningful, your brides wouldn’t dare think of using anyone else. After why would they…right? Now that you understand the significance of using a “World’s Greatest” mindset, let’s start creating an internal reality that reflects everything you already do well and find additional ways to make brides love you as well as set you apart from your competition. Create a sales process that makes your brides feel in charge. Update your website if it’s been longer than 3 years. Create a mobile website. A full 70% of brides use their smart phones to search for providers of wedding cakes. Create a sense of competence and trust in you and your staff. Have at least 200 wedding cake photos on your website. If you are average in appearance place a photo of yourself on your home page. If you have the space, have at least 15 wedding cake displays. If you have any current awards, make sure they’re being seen by your brides. Join a few professional groups and make sure their plagues are visible to convey trust. Write a book on wedding cakes to demonstrate authority and expertise in your field. Have your cakes been featured in magazines on TV or in other media? Offer to be interviewed on the radio or TV and place the video or interview on your website. Contrast what you do better than what the industry or your competitors do in general. Offer any general information about ordering a wedding cake or FAQ’s? Use professionally taken wedding cake photos or buy a good camera and take photos yourself. You need to have brides clearly see all the great details of your artistry. Use HD video for any of your messaging or wedding cake in place of photos. Use testimonials to demonstrate your social proof? Have ample cake flavors to choose from. Have ample fillings to choose from. Offer icings and decorations in more than just buttercream and rolled fondant. Be sure your icings are as good as or better than your competitors. Make appointment times convenient for her, not you. Have an on-hold message for your phone that builds your bride’s confidence. How many different closing statements do you try? Offer a longer consultations than your competitors. Do you answer the phone every time she calls or within 15 minutes? Dress the way your bride expects. Are you completely engaged and passionate every time you speak with her? What do you say to the bride when you first speak with her on the phone? What do you say to your brides at their consultations? Do you call your bride anytime during the sales process? Do you give her a “take away” like a presentation folder with valuable info? Do you give away a special gift or bonus at every first appointment? Call your brides after their receptions to see how you can improve your service and the perception of value for future brides. Are you Tweeting your brides? Use Facebook as a communications tool to post recent wedding cake photos or anything else you think would make brides view you as being an expert and offering superior service. Blog about wedding cakes in general or about your wedding cakes. Use Pinterest as a communications tool. Send out direct mail pieces. Advertise in local bridal magazines. Do joint ventures with other wedding vendors. Set-up and follow through with a referral plan. Network with wedding related networking groups…yes to get leads, but more-so to see what’s currently working for them. Be sure your messaging is consistent between all channels of communication. Are your booths at your bridal shows capturing leads and closing appointments? Do you serve only high-end brides or do you serve all budgets? Do you offer a free wedding cakes to celebrities in your city in exchange for recognition from them? Donate a portion of your profits to charity to demonstrate your social consciousness. Do you ever donate a free wedding cake to couples in need? How presentable is your consultation area? Is your pricing congruent with the mental image you’re presenting her? Do you price by the slice or by time and material? What are you offering your bride she can’t get anywhere else? Serve your brides, instead of simply taking orders. Sell your entire experience instead of just selling wedding cakes. Make a special offer to minimize the risk for a bride to buy from you. Alright that’s a pretty good starting list. The key thing to remember is, the more “Internal Reality” “Credibility Boosters” you use in your marketing and sales, the better experience you’ll be offering and the more you’ll be loved by your brides. 1) You already have an “Internal Reality.” Now, create a superior “Internal Reality.”2) Use the technique of being the “World’s Greatest” to improve yourself and your business so, brides to see you as the obvious choice. 3) The use of “Credibility Boosters” will help achieve “World’s Greatest” status and achieve the goal of WINNING more orders at higher prices. Prior to the concepts you’ve just seen, I tried advice from bakery owners, went to ICES conventions, RBA meetings, and scoured the web for answers to sell more wedding cakes. Everything I tried just didn’t seem to help very much. It’s only when I started doing my own research by talking to thousands of brides and surveying tens of thousands more from around the country, did I finally figure out what was holding my sales back. seem like the dreaded… pretty good. Now, I have to admit, that came as a shock to me, because I saw myself as way better than pretty good and I’m sure you do too. But I’ll admit, I let my ego get in the way. I thought the delicious cakes I baked using the best and freshest ingredients, my professional background, and my prices provided a far better value than my competitors. I just didn’t understand why brides thought my prices were too high, or they couldn’t see me as better than other bakers? It literally drove me crazy. That’s when I became obsessed with developing a wedding cake marketing and sales “Master Blueprint” that was not only better than…pretty good, it had to be powerful as love itself. The master blueprint or what I call the “Secret Wedding Cake Sales Code” is based on two main features. First, I used the suggestions from brides whom I’ve surveyed and spoke with while writing my guide “How To Buy The Picture Perfect Wedding Cake” and the years since to create the experience they wanted and expected. And second, I used known sales psychology and the psychological principles of courtship and dating to provide their experience. In a nut shell, WINNING more orders and charging higher prices doesn’t come down to guessing, it comes down to giving brides the experience they expect according to the research derived from over 110,000 brides around the country and delivering it to them utilizing established psychological principles. your brides will connect with to be their baker? Now that you’re privy to 3 of the Key Research Discoveries, is it starting to make sense why brides choose me over my competitors? But more importantly, do you see how the research would give you the same decisive edge for getting higher prices and getting more brides to choose you? If you agree, you’re really going to love everything I’ll share with you in my here’s how you do it, A-Z jam-packed course called, Cracking The Secret Code That Unlocks Your Wedding Cake Sales.